When you think of a kitchen, you can’t imagine it without a good knife, right? There are a variety of models depending on their use. Knives with long blades or short blades, bulky or thin, light or cumbersome, the choice isn’t easy to make. 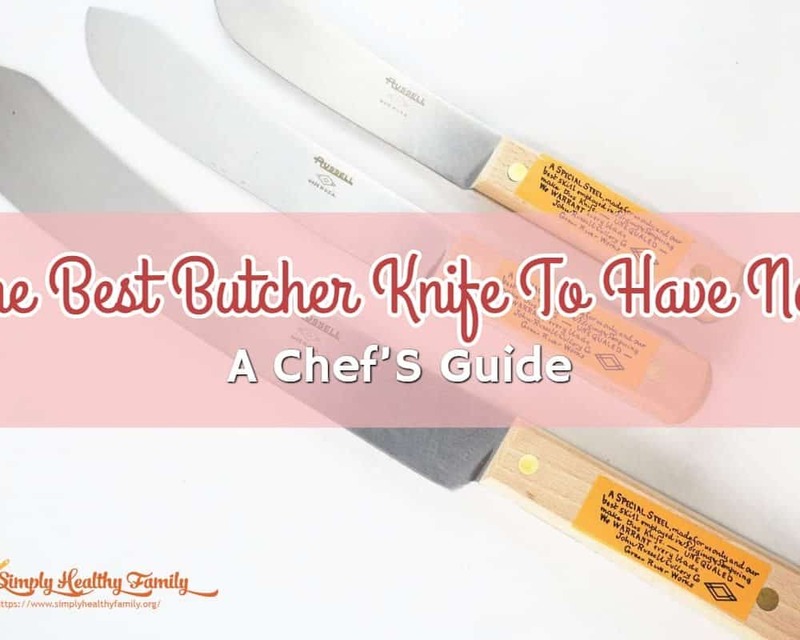 In this text, I am going to test and review 5 knives models to help you choose the best butcher knife. 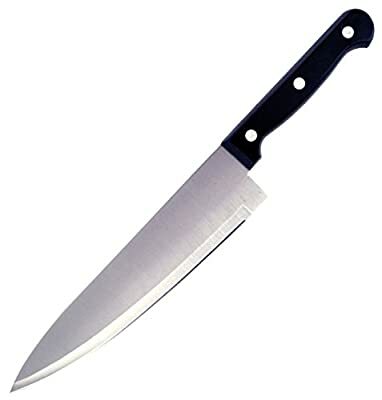 A butcher knife is also called a butcher’s knife. It is primarily used and designed for butchering and boning animals. Explorers who lived in wildness originally used the butcher knife. Because they were uncomplicated, cheap for production, and easy to use, butcher knives were a primary surviving tool for a mountain man. These knives were used for cutting food, self-defense, scalping and skinning animals. Nowadays, butcher knives are used in both, the meat industry and households for processing meat. The blade allows stripping, cutting and splitting meat. There are many derivations of butcher knife like carving knife, boning knife, cleaver and chef’s knife. A carving knife is a long knife (it length can be up to 38 centimeters or 15 inches) used for chopping thin cuts of meat, ham, roast, poultry and other large pieces of meat. It is thinner than chef’s knife and has a scalloped blade for better separation of the cut pieces. A cleaver is a large knife that in most cases resemble on the hatchet. It is used for cutting bones, splitting meat and bone, and crushing food. It is easily distinguished from other kitchen knives thanks to its’ untypical design. Cleavers’ blade is heavy and thick because it mustn’t bend, crack or splinter during the use. The edge is beveled, and the bevel is convex. Cleaver is used with a swift stroke. Many cleavers used in households are 15 centimeters or 6 inches long and have a hole on the blade for hanging on a rack. Chef’s knife is also called a “Chinese chef’s knife” or “Chinese cleaver” because of its’ rectangular blade. It is used as a utility knife. Chef’s knives are not suitable for cleaving but are good for slicing. 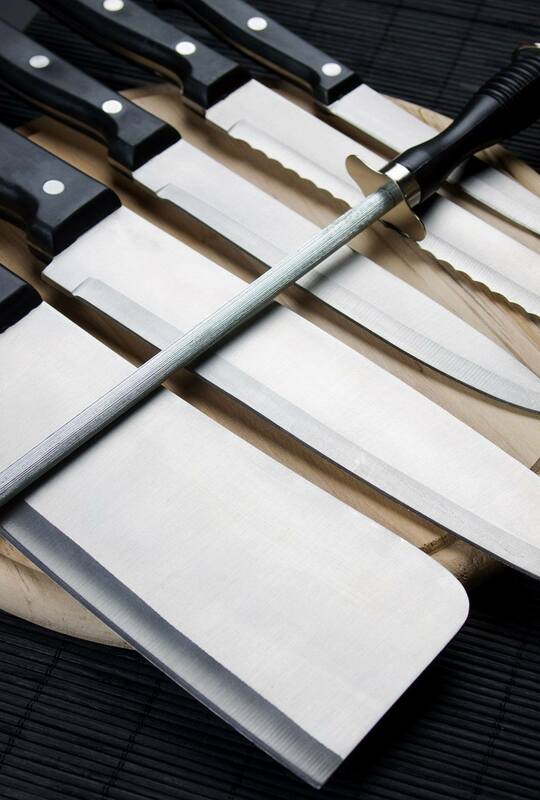 Before choosing the right butcher knife, you need to pay attention to material, handle, blade, edge retention, rust resistance, slip resistance, comfort, and hardness of the knife. 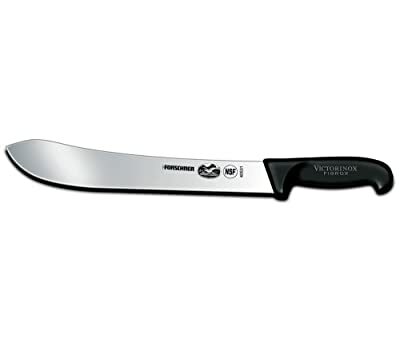 VG-10 – The top-quality butcher knives are made of VG-10 steel. These knives are known as stainless, sharp and lasting. 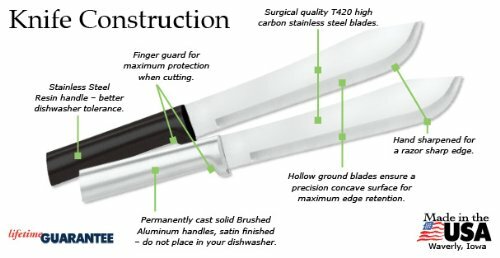 Butcher knives come with wooden, plastic and steel handles. Wood is a suitable environment for bacterial reproduction, so wooden handles aren’t recommended by health inspectors. Wooden handles are not as strong as steel handles. Plastic handles are the most popular knife handles because they are very suitable for usage. Also, they are comfortable and light which is important when you need to use the knife for extended periods of time. Furthermore, plastic handles are very easy for cleaning and maintaining. The only problem with plastic handles is that they are not durable and they often break after only a few months of use. Steel handles are great balanced and stable. Also, they are easy to clean, and they are recommended by health inspectors. The disadvantage of steel handles is that they are not comfortable as wooden or plastic handles. The butcher knife blades are made in two processes: forging and stamping. Forged knives have bolsters. Bolsters are specially designed only for forged knives, and their purpose is to provide balance and save users’ hand from shifting on the blade. In addition, forged knives have larger and heavier blade than stamped knives. In most cases, forged knives are more expensive than stamped knives because they are stronger and better balanced. Edge retention implies how long the blade can stay sharp in spite of being used for extended period. High wear resistance will prolong the blade sharpness. Also, high-carbon steel blades provide longer blade sharpness. High-carbon steel blades and blades that have non-rust coating are resistant to rust and corrosion. Slip-resistant handles are designed not to allow your fingers or hand to slip from the handle. Most plastic handles are designed this way. Wood handles can also be a good choice. Steel handles can sometimes be slippery, especially if your hands are wet or greasy from the meat you are cutting. Comfortable grip is one of the most important features of every butcher knife. 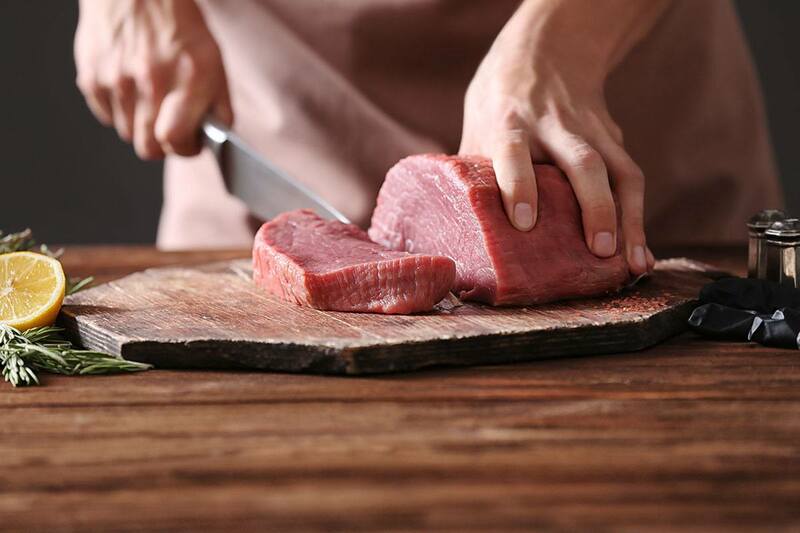 The use of the knife must be convenient especially if you are using the butcher knife more than 5 minutes per day. In addition, a comfortable grip provides safe use and easy control. Balanced and not too heavy knives provide adequate comfort. Blades can be hard and flexible. Hard blades don’t bend during the cutting process. They are an excellent choice for beginners because flexible blades are more difficult to control. Flexibility prevents the blade from breaking during the use, but if the blade is too flexible, it can cause injuries. Let’s take a look at the reviews of the five best butcher knives that you can get on the market today. 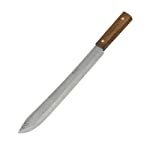 With a 10-inch cutting edge, the Old Hickory butcher blade is made of high-quality materials and developed to preserve through the hardest conditions. It has a wood handle and an empty ground edge, which is made of 1095 high carbon steel, tempered and made to stay sharp for a long time. Its overall weight is around eight ounces. The 7111 Hickory Knife is ideal for skinning, chopping and for some light machete work, making it the sort of blade you would want to take with you on camping. The best thing about this knife is its price which is very affordable, and it is ideal for those on a tight budget. However, there are some drawbacks regarding the steel of which this knife is made. It is not stainless, so you will have to be extra careful with it. This knife has a real hickory wood handle which is flame burnt and finished for a particular vintage wrap up. Still, the wood can accumulate bacteria if not cleaned regularly. Overall, this knife’s quality is exceptionally trusted as most expert butchers and chefs utilize this particular butcher knife. The Brandobay Straight Butcher Knife has a 12-Inch blade, which is intended for cutting meat, vegetables, and fruit. It is very suitable for making slim cuts of different nourishments. With its sharp and flexible stainless steel blade, there is no need to be frequently sharpened. This knife has a very flexible blade. It is made from stainless steel, and it is very sharp. As for the handle, it is slip resistant, and it has an ergonomic design. However, the handle is very lightweight, without a good balance, so it was hard to get a good grip with it. It was very easy to clean this knife since it is not prone to rust and also, it is dishwasher safe. Be aware though, that it was somewhat difficult to cut through tough meat because its thin blade tends to bend, unfortunately. This knife is delivered with a stainless steel cutting edge and a dark handle for simple cleaning. Its handle is plastic meaning it will not slip your fingers over the blade. Its blade is made of empty ground edge making it very suitable for fine cutting. The Rada Cutlery R109 Old Fashioned Butcher Knife has a surgical-quality T420 high carbon steel cutting edge which is hand-sharpened making it razor sharp. It is also hollow grounded to offer a perfect concave shape for a high-edge maintenance quality. This is a very lightweight knife since it was made with aluminum and with a thin blade. The handle is about seven inches long thus being suitable for people with small hands and working in small spaces. However, this size has its disadvantages since it is not suitable for tough meat, but for fish, poultry and consumer grade meat will do just fine. Also, it will do well with solid vegetables, potatoes, etc. which is always a plus. This knife’s handle is made from permanently cast solid aluminum and wth satin finishes, it is looking very elegant. However, with this design, it isn’t safe to put it in the dishwasher. Also, it has a finger guard which is designed to protect the hand while cutting. So, if you are searching for a light and quick knife, also good looking – look no further. The Victorinox Cutlery offers stamped 12-Inch Straight Butcher Knife that can handle huge tasks effortlessly. It is ideal for cutting entire meals and extensive lumps of meat. It is made of a high-carbon stainless steel, which offers ideal sharpness and extraordinary edge maintenance. The cutting edge is ice-tempered to make it sharp for quite a time. This knife was very easy to use. The blade is very sharp with the edge that goes all the way down to the handle. This makes it easier to sharpen, and it allowed me to use the entirety of the knife with less strain on my wrist. However, it may not be ideal for everyone since it is a large knife, even too large for kitchen use. The handle of this knife is produced using a protected Fibrox which is ensured to be slip-safe. The handles’ ergonomic design also makes this blade very much balanced and comfortable. Be aware that the hand washing is advised for cleaning purposes. Also, it comes with a lifetime warranty which is just another proof of its quality. With its 10-Inch blade and 58 pounds of weight the Dexter-Russel Butcher Knife is made with a straight edge which can cut meat without tears nor shreds. It has a pointed tip which can cut large roasts and vast meals into thin pieces. It is a simple looking butcher knife which excels when it comes to performance. It cleans very easy and holds an edge pretty well which I liked. The handle, however, is a little too thick compared to the other knives, so it was a bit uncomfortable to use. Also, this is an expensive knife compared to the others, but it does the job well, and it is very well made. It will certainly live up to the expectations of any butcher. It should be noted that it is a little on the bigger side with its 10-Inch blade and handle, so it may not be suitable for home use. This knife also includes a Grip-Tex handle which is made of plastic. This means it is very lightweight and very slip-resistant. Since the blade is made of stainless steel, you will not have to worry about corrosion and rusting. After testing all five knives and comparing their features, I have decided that the best butcher knife that can currently be found on the market is Victorinox Cutlery 12-Inch Straight Butcher Knife. Victorinox butcher knife has an incredibly comfortable handle, so it is suitable for both men and women. 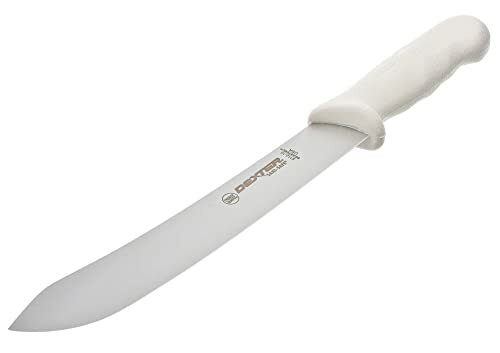 The difference between this butcher knife and other models is that this knife has the edge that extends all the way to the base which eases the blade sharpening process. Ice-tempered cutting edge provides long lasting sharpness and blade made of stainless steel keeps this knife safe from rusting. Easy maintenance and extraordinary quality make it an absolute winner.